A proposed U.S. Foreign Military Sales deal to upgrade Swiss Hornets has been approved by the U.S. State Department. 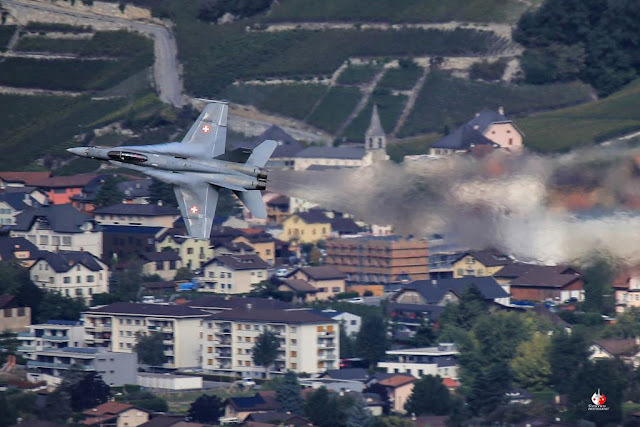 According to DSCA media release the Government of Switzerland has requested, through the Foreign Military Sale program, a Service Life Extension Program for its F/A-18C/D aircraft. It includes up to fifty (50) Multifunctional Information Distribution System Joint Tactical Radio System (MIDS JTRS) with Concurrent Multi-Net 4 (CMN-4) capability; fifty (50) ARC-210 GEN 5 RT-1900A(C) radios w/Second Generation Anti-Jam Tactical UHF Radio for NATO (SATURN) frequency hopping; twenty (20) Joint Helmet Mounted Cueing System (JHMCS) Night Vision Cueing Display (NVCD); CIT Automated Dependence Surveillance-Broadcast (ADS-B) Out; software enhancements to the APG-73 radar; improvements to the F/A-18 Software Configuration Set (SCS) 29C; and sustainment for the ALQ-165 Airborne Self Protection Jammer (ASPJ) system. Operational support for these modifications will be provided through upgrades to the unique Mission Data System included in Swiss fighters. Also included are: system integration and testing; software development and integration; support equipment; spare and repair parts; maintenance personnel and pilot familiarization training; software support; publications and technical documents; U.S. Government and contractor technical assistance; and other related elements of logistics and program support. The estimated total case value is $115 million. This upgrade is crucial to allowing the Hornets to continue the Quick Reaction Alert (QRA) service to defend Switzerland's airspace until the enter service of a new fighter jet.